Back at the start of May, we were having a blast of nice weather and decided to make the most of it by going for a family walk. 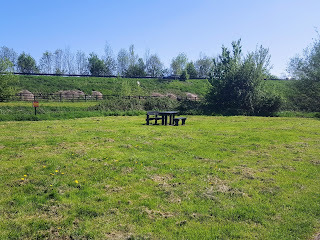 I had been playing about on Google Maps trying to see if I could work out where a picnic table I could see from the Road was and why it was in the middle of a field, and discovered that there was a walk in this field, and it was called Waterhall Park. 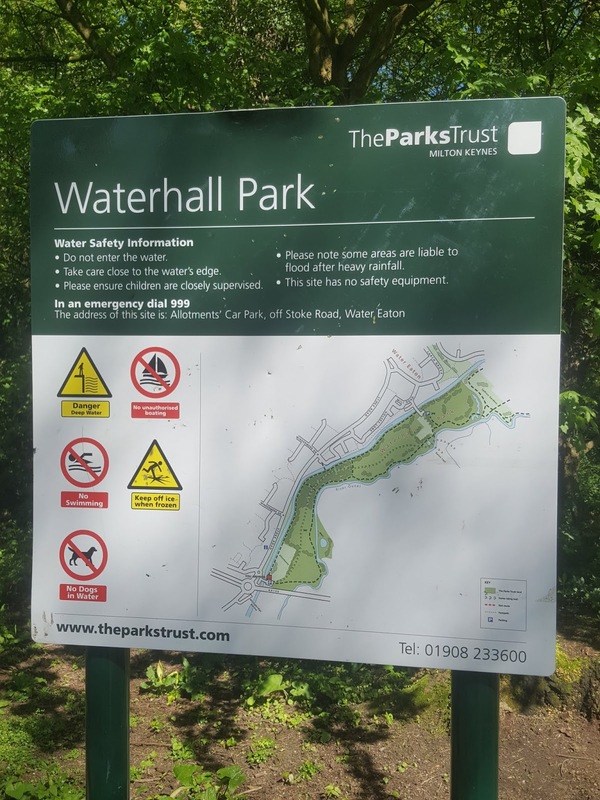 We arrived at Waterhall Park and have since discovered that we didn't park in the "official" car park at the North of the park, but the smaller one by the allotments at the south of the park. Honestly, the small one only takes about three cars, don't make the same mistake we did! 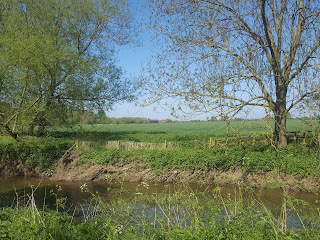 We followed a public footpath that led from the carpark (same set up at the North end) and soon found ourselves walking alongside the River Ouzel, but not before we found the picnic bench we could see from the road. 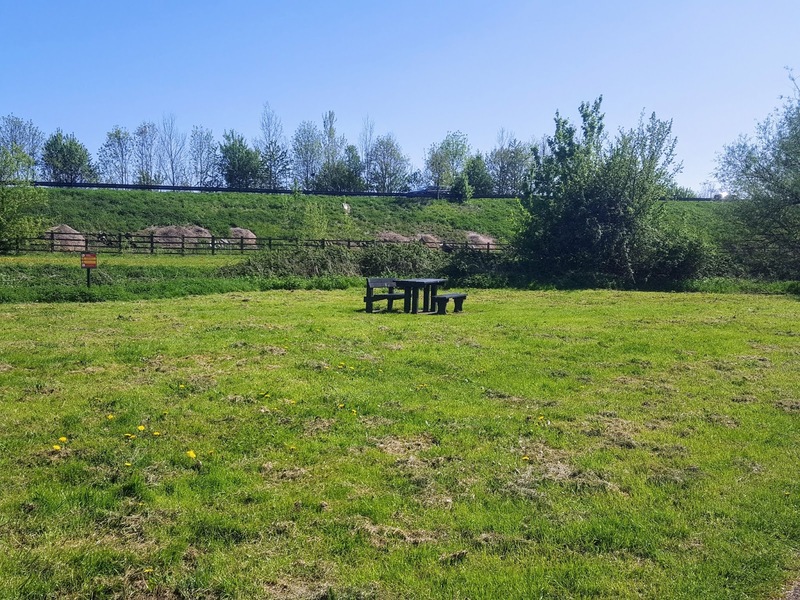 It really is a nice field, but it does seem an odd place to put a picnic table. Anyway, we were more interested in looking at the nature along the River Ouzel, which is a tributary of the River Great Ouse, which is where we go open water/ wild swimming and so we were looking out for waterfowl, otters and anything else that was"proper" nature. 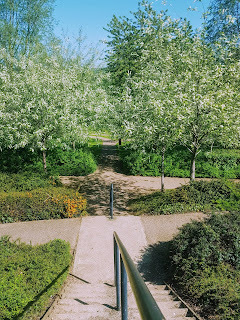 The walk was lovely, there was some shade from trees and so we were dappled in light occasionally and we met plenty of people also out for a walk, but it was certainly one of the less busy Parks Trust Parks in Milton Keynes, probably because it is tucked away a little, but also because it isn't officially in Milton Keynes, but in Bletchley. We even found a pretty scene that we all took a picture of (Top Ender had taken out her proper camera) so we could see who took the best composition/ how we all picked different aspects to feature on. I'll write another post with the pictures in so you can see in the next few days! The pathways to walk along were perfectly accessible, we did nearly get run over by a few bikers, but did agree that this would be a good walk for those who need a "proper" path, although down by the river, we can see it flooding if the weather was wet. The landscaping in the park is amazing. We all commented at different times how we felt that we weren't in the United Kingdom, but on holiday in mainland Europe somewhere. 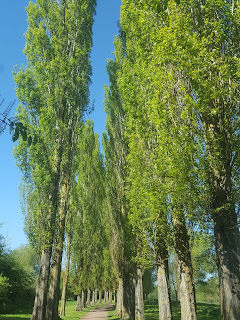 Mind you, it could have been the weather making us think that, or these Lombardy Poplar trees which were so tall! 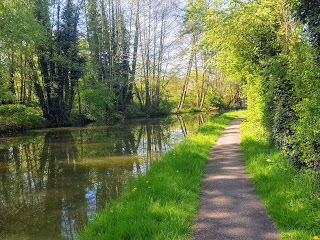 We decided to walk back along the Grand Union Canal, instead of through the park, just for a little variety and also we were walking at roughly the same speed as another group and didn't want to keep gatecrashing their family outing or have them gatecrashing ours! As we walked along, we saw plenty of Barges and ducks and did contemplate walking to Leighton Buzzard to visit my Mum (Canals are pretty flat, so the 6 miles wouldn't have been too taxing on us), but decided that we would much rather go wash the car before going home and have something cool to eat... Sorry, Mum! The walk was really lovely, and I know we'll be back soon.